Choosing the best tent can be a daunting task because tents are characterized and categorized, according to its shapes, features, types, and sizes, not to mention their brands. A tent is also considered as an important investment, mostly for family use. So, buying the best one is a crucial step throughout this endeavor. The best tent brands today offer very impressive features and durable materials, including high-grade technologies to meet the requirements of every consumer. However, not all tents are the same, as these products are individually designed for a certain purpose. Family tent and camping tent reviews will surely help any potential buyer in choosing the best product, explaining every feature and recommending the best item to suit a customer’s style. 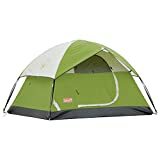 The following are top-rated camping tent reviews on Amazon, offered by trusted brands and loved by millions of customers. There are tents for all kinds of outings – backpacking, teaching, and winter. You might consider buying a 1 person tent for times you hike or backpack out with friends and prefer to sleep alone. There are tents for sporting events, the beach and your backyard with an open front, an overhead shade, vented windows and walls for privacy. Then again, you might opt for a tent that can fit your entire family when you go camping. If you buy a tent for camping reasons, make sure to look for weather resistant material with reinforced seams to prevent leaking. I like to make sure that my tents have adequate windows for ventilation and have a fly to go over the top. The ventilation is helpful if you use a lantern or heater in your tent so it can let the fumes out. Nowadays, tents are made with super-fast setup designs. Most of these come with poles already set up, and inside the tent, so you don’t have to mess with them. The easiest tents come with a bungee that you pull to pop out the tent. There are a few others that require a few connections to be made but can be set up in less than 5 minutes. We are reviewing tents for every personality type and budget. Take a look below to find your next tent. 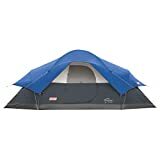 The Coleman Sundome Tent garners an average rating of 4.5 Stars on Amazon. This type of tent can hold up to six people easily. It also features an easy setup and tear-down systems, just in 10 minutes with its Insta-Clip poles. Among the best camping tents, the Sundome Tent from Coleman is made of durable TC fabric construction, including a waterproof WeatherTec system. It measures at 10ft in length, 10ft in width, and 6ft in height. It is the best family tent as it can accommodate up to six family members or friends. Its WeatherTec system can keep the rain at bay. With this model, Coleman boasts a breathable ventilation system, keeping the airflow and the bugs out at the same time. Coleman is a trusted brand by millions of consumers across the globe. Thus, the Sundome Tent assures the user with unwavering quality in the world of outdoor gear and camping. Coleman is an internationally-acclaimed company that offers no less than high-grade tents, coolers, stoves, lanterns, sleeping bags, and more. The best camping tents of this brand are ideal for a wide variety of activities, ranging from camping to hiking, hunting, fishing, swimming, boating, four-wheeling, tailgating, and so on. Sundome Tent offers the simplest setup ever found on any family tent and is best for short trips, backpacking, and campgrounds. Consumers will certainly expect the ‘Coleman quality’ through this product with nice and smooth zippers without nags. Overall, the tent is light, while offering a lot of ventilation, while avoiding internal condensation simultaneously. It is also capable of fitting a queen size air mattress as well as ample room for backpacks, gear, and footwear. It’s easy-to-setup, and pack-up design is possible, even in the dark. The Coleman Sundome is among the best camping tent brands of good value and a great price that can last for several years. Also with a 4.5-Star Rating on Amazon is Coleman’s 8-Person Red Canyon Tent. Based on 8 person tent reviews, this item from Coleman can undoubtedly accommodate up to eight persons. It measures at 17ft by 10ft with 72 inches at center height. The Red Canyon includes room dividers that serve as privacy walls, allowing the users to create three individual rooms inside. Again, this Coleman product makes use of its very own WeatherTec System, keeping the users dry from an unwanted wet weather throughout the camping trip. This tent also features an easy setup mechanism with its easy-to-follow assembly instructional guide and its shock-corded poles. 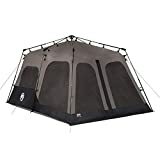 Indeed, it is among the top-rated family tents, considering its Variflo adjustable venting system and Cool-Air port that allows airflow adjustments and gear access. A little mesh panel for the ceiling is likewise included, which is intended as a small cargo hold. The 8-Person Red Canyon Tent is very spacious, offering up to eight campers to sleep comfortably. Hence, it is perfect for weekend camping trips with friends and family. It is also perfect for backcountry adventures. With this tent from Coleman, consumers rest assured with a more enjoyable outdoor activity as it does not pick a certain season. It is a brand that can hold out for a very long time without tearing or leaks. With the Coleman brand, replacement parts are easily found and available if necessary, thereby there’s no need to worry when it comes to spare parts and accessories. All in all, the Coleman 8-Person Red Canyon Tent is very easy to setup and pack-up, made with high quality materials, and makes use of high-grade and reliable technologies that ensure flawless and more enjoyable outdoor activities with friends and family members. It is certainly the best family tent for the money. 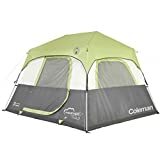 The Coleman 6-Person Instant Tent also receives an average rating of 4.5 Stars on Amazon. 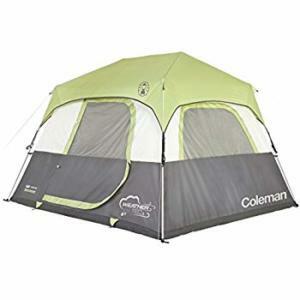 Among the best tents for families, this item from Coleman offers a very spacious interior that can accommodate two queen-sized air beds, considering its measurement at 10ft by 9ft footprint, and 6ft 2 inches at center height. In just a minute, this tent can be assembled very easily through its pre-assembled poles. Coleman’s WeatherTec System is also used in this family tent, along with the patented welded floors, plus inverted seams that keeps water out. The 6-Person Instant Tent also features illumiline reflective guy lines, providing greater visibility throughout the nighttime. Furthermore, it has built-in, vented rain fly that gives added weather protection. Certainly, this tent from Coleman lives up to its name with its instant setup feature and an innovative one-piece design. The poles are already pre-attached to the tent itself, eliminating the laborious assembly task, while reducing the risk of lost parts. 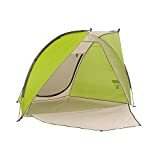 This is one of the best tents for family camping as its six-foot center height allows the campers to stand fully upright. The tent’s steel poles are highly durable, standing up even too stiff winds. It also has leak-free seams, aside from the fully-taped rain fly seams that cover the doors and windows. Velcro-frame attachments are also incorporated into the overall design, offering optimum convenience. The overall construction is made of weather-resistant materials, which is a combination of coated polyester fabric, anti-wicking thread, webbing, plus zippers. The inverted floor seams are likewise helpful in increasing weather resistance dramatically by hiding the needle holes in the tent. It is one of the best tents for families because of Coleman’s wind strong frame, which is engineered to be more wind-responsive and stronger, including the guy-out triangles and redesigned poles that result in increased performance. Consumers can also enjoy a limited one-year warranty from Coleman against defects in workmanship and materials. The Wenzel Klondike Tent – 8 Person is the best 8 person tent on the market today. It is a family dome tent with attached screen room. It is entirely made of weather-repellent polyester combined with polyurethane coating. It also features a full mesh roof option, along with double-staked power corners for added stability. The Klondike’s screened areas serve as a sunroom or could be a second sleeping room. With an average rating of 4.5 Stars, this dome tent from Wenzel measures at 16ft by 6.5ft by 11ft, weighing at 27.3 pounds. Based on 8 person tent reviews, the Klondike is fantastic, even for the first-timers. The stakes are easy to install while securing the tent at the same time. It has several windows and a full mesh ceiling, which are both perfect for star gazing. Customer reviews also reveal that this is the best large family tent with a king-sized mattress can fit in the second room while providing extra space for moving and walking around. The first room, meanwhile, can be used as storage space for some clothes, footwear, and bags. The floor is among the best selling points, compared to other two-room tents around, allowing the users to walk around without the dirt on the ground. 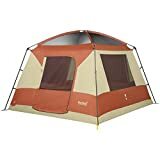 The Wenzel Klondike Tent – 8 Person is highly durable that it can surpass even a 35mph wind or a stronger one because the parts are securely tied all around. Indeed, high-grade materials are guaranteed with this tent, considering Wenzel as a trusted designer of outdoor gear and modern tools. It is one of the best large camping tents ever made by Wenzel, creating the Klondike with ease and comfort in mind. Wenzel has always been committed to providing unmatched outdoor experiences to families. Thus, they tend to create their products based on the needs of families. Undoubtedly, quality and efficiency are guaranteed with Wenzel’s sleeping bags, camp pads, and top family tents. The Wenzel Pine Ridge Tent is a 5 person family tent and among the cheap tents on the market today. It is a two-room family dome type, which is perfect for small families of four to five. This tent from Wenzel also garners an average of 4.5-Star Rating, similar to its big brother. The Pine Ridge is constructed with weather armor polyester and polyurethane coating. It features 1 mesh window, mesh roof, and 2 mesh doors, plus a hanging divider curtain. The poles are made of shock-corded fiberglass with a grommet attachment system that results in a convenient setup. One of the best tent brands, the Pine Ridge from Wenzel measures at 10ft by 8ft, with a floor area of 80 sq. ft, 58 inches peak height, and 11 pounds in weight. While its canopy is made of polyester, its floor is constructed of welded polyethylene. Thus, it is more durable than nylon, which is commonly used by other brands. This Wenzel dome-type tent also has a very reasonable price tag, not to mention its perfect color combination of green and gray that can blend with the woody environment. The Pine Ridge is certainly one of the best family tents for camping, not only during the summer but also all year-round due to its excellent ventilation and easy setup and pack-up mechanisms. 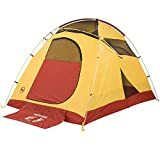 With this tent, families can create memorable camping activities, having a shelter in the woods or the forest, campgrounds, by the beach, or any area outside the home. It is also the best tent for family camping, boasting its revolutionary Lite Reflect system, an even and useful glow of light all around. Without a doubt, this best selling tent from Wenzel is the best family tent for the money with innovative design, useful features, and an overall sturdy construction. This classic two-person tent is light weight to carry. This is a nice portable frame tent with a single door but two windows. The area of 38 sqm. Ft covered by this tent makes it a spacious enough to camp. It has a fly which is used as a protection against the bad weather, but when the climate is dry, it can be lifted up. It is a well-ventilated product because of the provisions provided such as windows. The spacious element of this tent makes even a taller person fit in easily. Though the product is a little expensive, it is worth every dollar of it as it can easily take an extra person in it. 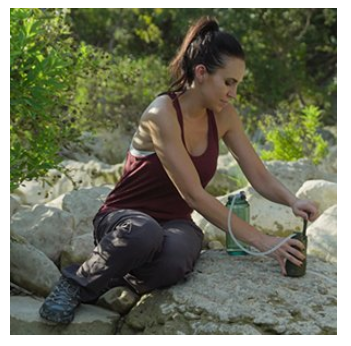 This brand new backpacking is winning a lot of reviews because of its excellent durability. The zipper enables easy fastenings. It is specially designed for kids when they are out on school trips and a single person. The height of the camp lengthwise enables an average height person to fit in but a taller person may find it tough to fit it, but you can find out a way diagonally. I donâ€™t think one can find a better option than this at such a price. The frame shape tent is suitable for bikers as it is very light to carry and comes with a handle to support. It is a free standing tent for easy setup. This product could be the best gift for your kid. This is a sturdy backpacking very suitable for Boy Scout troops. It can easily be set up without any help. Owning this camp gives you the benefit of having adventures trip at a very reasonable price. This sturdy product is a perfect fit for two people. The only disadvantage of this product could be that taller people might find it difficult to fit in. The making of the product makes it difficult to fit cold weather, so one will have to carry all the necessities. The replacements parts for this tent are easily available. It is a very lightweight product too. Keeping the negatives apart, one cannot go wrong in buying this product. Check out this Lightspeed Quick Cabana tent. This tent is suitable for places with warmer type weather such as your backyard or the beach; I love taking mine to my kid’s soccer games. I love that the poles are built into the tent, so it is super easy to set up. There is a drawstring that simply needs to be pulled to open it up. This tent gives you a three-walled shelter system with a sunshade over the opening. Once folded up and put away, it is very lightweight and easy to carry. We live in a windy area so the sand pockets on the outside are great to keep the tent in place. The “porch” area is roomy enough to accommodate me, my husband and our two kids quite comfortably. There are three windows provided that rolls up as well. The Big Agnes brand is known for their technologically advanced designs that incorporate the latest advances in fabric technologies, with the cleverest designs. The result? Camping tents that are simply fantastic! The Big House is a spacious tent that was voted the best family tent by a leading consumer website. It offers easy setup as well as great weather resistance, making for a cozy slumber no matter what your conditions are. It’s relatively inexpensive and is also lightweight and compact. Reviews of the Big House tent often mention the extra cost associated with the Big Agnes Big House. While it might seem significantly cheaper than the other top name brand tents, you have to keep in mind that almost any accessories cost extra above the advertised price. The Nemo Losi 3P is another highly rated tent. Reviews often praise the Nemo Losi brand for their spacious and comfortable tent designs. It is reasonably priced and capable of sleeping up to three people comfortably. Most impressively, the Nemo Losi features a lifetime guarantee. Combine this with its easy-to-care-for machine washable fabric, and you have the makings of a top tent! So, what’s not to like? Some reviewers criticize the 3P for its weight, but this is only an issue if you intend on taking your tent hiking or backpacking with you. These are just three of the best camping tents available today. These tents consistently receive rave reviews from experts on camping. Tent reviews are often difficult to decipher. Hopefully, this article has given you a clear idea of the kind of tents you should be looking at. 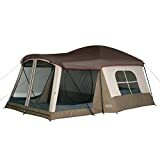 My favorite here is the Kodiak Canvas Flex-Bow Deluxe 8 Person Tent. It’s very sturdy and is made with 100% cotton duck canvas that is watertight but breathable. It has two D shaped doors both on the front and back, and has four big windows with no-see-um mesh. It has a very large 6″6″ ceiling height as well. This tent features ventilation and holds the heat inside a lot better. If you want to buy a tent that can last through generations, this is it. 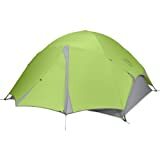 Check out the Kelty Parthenon 8 Tent. This is a tent to fit 8 people. It is fairly easy to set up, though takes longer than many others I’ve used. There is a divider inside for privacy and the mesh panels help keep the tent cool in warmer weather. The organizer wall is nice since it has pockets for all kinds of camping essentials like toilet paper and flashlights. The advantages of one man tents are that they provide sufficient privacy to the camper along with adequate space to move around and store necessary accessories like mugs, clothes, and shoes. The weight of the tent is 3 pounds, which allows the camper to carry it anywhere he goes. The polyester taffeta and the taped seams prevent water from entering, and the window allows air to pass through. The well-built posts and corner grommets make the tent sturdy enough to resist strong winds and rainstorm. Till now there are no disadvantages of the one man tent apart from the unavailability of the product from showrooms. You can only order the tent from the companyâ€™s website. Eureka Cabin Tent is the perfect waterproof vertical tent for families. 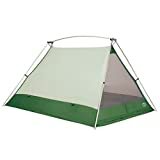 Even though the rain fly is not full and the top of the tent is all mesh and see through, based on user reviews this tent never fails rainy weather. The frame is very sturdy, made of steel and fiberglass for the best flexibility and resistance. Easy to set up, it uses sleeves for poles and pins to rings system. The tent itself is so spacious, and the vertical walls will never require you to bend over. Due to the height of the tent though, the windows can’t be opened by children, and as for some this could be an advantage, for some it’s inconvenient especially because the tent has 2 rooms: you might want to sleep your kids in the other room. This solo tent is manufactured by the Eureka Company, which is highly known for creating tents for various purposes like camping, refuge, and events like weddings and parties. Along with tents, Eureka also creates canopies, sleeping bags and all the related accessories for outdoor activities. The company is a registered name of the Johnson Outdoors, which started manufacturing tents and related products about 100 years ago for refugees and citizens of America during the Industrial Revolution. Since then a variety of tents are manufactured for different purposes and according to the number of campers, like The Backcountry 1, Suite V6 and the Apex Series. Every tent is suited to a different weather as well as to a different season. The special features are that they offer a personalized space for a single person. The tent is made from waterproof material, which avoids rain or flood water to enter from any of the attached corners. The sealed seams prevent the tent from leakage, and a huge window allows air to circulate to and fro to provide an airy and fresh atmosphere to the camper. One door for the entrance has zipper pulls to seal the tent at night while sleeping perfectly. The tent is available with a height of 3 feet and 2 inches, which allows the camper to move around without much difficulty. The frame is made from Aluminum, and the post and corner grommets are colored to make them easily recognizable to setup. A-Frame Tents are temporary, free-standing structures with lightweight vinyl top stretched for some purposes from camping to organizing large events. The vinyl topping is a very durable and a weatherproof fabric. These tents are secured with the help of ground pegs. A-Frame tents are available in one piece or various sections and can be installed on any base. The best feature of this frame tent is that it stands in the absence of any central pole, unlike other traditional tents. With the passing time, the inclination of people towards recreational activities has also been rapidly increasing. This calls for the need of continuous efforts in improving camping tents to serve the needs of the people. Everybody is looking out for a second home even when planning a vacation with friends or family. To cater to the needs of different segments of customers, many manufacturers have come up with various tents sorted with the style feature, accommodation size, additional facilities provided, etc. Amongst all the highlighting features in any tent, one which any person always looks for is the accommodation spacing provided. Larger the tent, the more comfortable it is. The trend for Size Does Matter has taken the lead. Though there is a limited number of companies manufacturing larger sized tents, the ones who make it make it the Best, the most reliable and finally the most durable ones at a reasonable price. Eureka N!ergy 1310 Tent: This tent comes with a lifetime warranty. Easy to clean and excellent ventilation system gives an edge. They also have a room divider which offers plenty of privacy. The straight wall tent contour gives it the liberty to fit in any bed size. Coleman Weathermaster: Most luxurious family tent comes with 3 separate rooms promising complete privacy. It also an inbuilt electrical access point for charging your electronic items as and when needed. Swiss Gear Montreaux: The Pin and Ring technique makes it stand up very easily in no mins. The unique flooring is made up of drinking water-resistant fabric. So much to find at such a reasonable price is definitely to be owned. Any good tent will promise you all the below features, so don’t forget to check all these out. It is a ying-yang relationship, with everything good comes the bad also. Statistics show that lesser familiar brands always come with the reliability issue. Listed down are a few brands you should be aware of while purchasing one for yourself as their lesser pricing will always lure you. The major drawback of these tents is that though they promise to be waterproof, you will end up swimming instead of camping. I know that sounds funny, but you can bet one! Apart from all the credentials which every top family tent are carrying, one important thing to be kept in mind is that you should never hesitate to pay a little extra for that extra quality. While there are cheap tents also available against these high-end tents, the former’s durability can never be matched to that of the high-end tents. Camping with your family can prove to be quite challenging. You have got it all planned and packed, but if something is going wrong, then you will have a lot of responsibility to deal with, especially if you have a large family. As a parent, the first things you are concerned about are your kids. You want them to be safe and comfortable and to enjoy especially their first outdoor experiences. You know you will need extra care when picking up your camping gear and you need something you can rely on. You can find many products on any sports market, and we firmly advise you to pick them up yourself rather than ordering them online. You need to check yourself whatever camping tent you are buying as online shopping can be deceiving. Buy a tent that can accommodate at least one more person inside of it. Families need space, especially when there are kids involved. Plus you have to consider that you will also need space for all the baggage. For the best weather protections out there only pick up the tents that have sealed seams and a full rain fly. Rain is the most dangerous weather condition for your tent. If it is not completely waterproof, rain will leak in and soak everything inside. Of course, also you can purchase waterproofing solution and make sure you run a watering test on your tent before camping in it. Make sure you have plenty ventilation inside of your tent. Especially if you need to accommodate more people inside and if the weather is rather hot, you need excellent ventilation. Make sure you have windows on every wall of your tent and consider buying an air conditioning device for your tent. Coleman never seems to fail to deliver when it comes to camping gear. And we suggest you first take a look at this producer, for just about anything you might need. 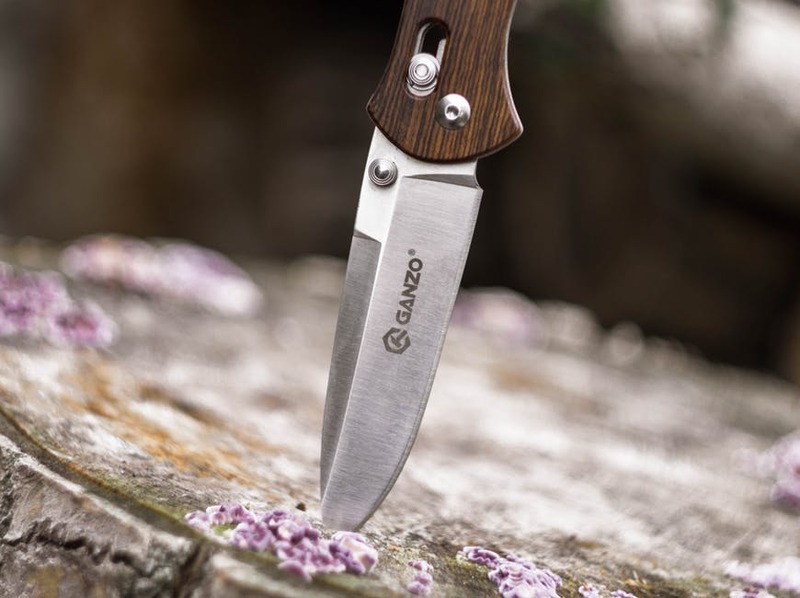 They have a good quality/price ratio, and if you are not taking camping to extremes then you have nothing to worry about, in fact, you will love every single piece of Coleman gear. This tent can accommodate up to 8 people, and the best part of it is that it is straightforward to set up and it is very well ventilated. Although the set up is meant for 2 people, it can easily be managed by one tall and strong. The tent is one piece made; it does not require assembling any parts, the tent poles are attached and telescopic, so all you need to do is extend them. It has 7 windows, and the interior can be divided into 2 rooms. The downside would be the weight, 45lbs is not something anybody could carry, so even transportation from the car to the camping ground can be a two person job. For campers who are preparing for their very first trip to the woods or for many other outdoor adventures, having the best tent is very essential. Therefore, it is also important to learn about the different types of tents that are available on the market to find the right one, suiting their personal needs and the environment at the same time. Below are the most important factors that any potential buyer of tents should consider. Perhaps, the size of the tent is the most crucial factor to think about when buying such product. Of course, the best tent for a family of 4 will do very well for families with four or fewer members. Keep in mind that the size should provide ample space for sleeping comfortably while giving added space for camping gear and accessory storage. The head room, living space, and eating space could be optional, depending on the family’s requirements. The material used in a tent is worth-thinking about. While the best tent brands offer different materials in the construction of their products, it is still vital to learn about the pros and cons of each. Canvas is durable, but it could also become very heavy, especially when used in large family tents. Meanwhile, nylon is lighter and designed for calm conditions. Polyester, on the other hand, is perfect for long periods during sunny conditions, withstanding excessive sunlight exposure, and even cold weather. Before you end up with a certain brand of tent, it is important to make sure that such item is suited for a particular weather condition, thereby; you have to determine the main purpose of your tent. For rainy or stormy weather, it is sensible to ensure a 100% waterproof tent, including a rain fly that provides total coverage. An extra tent porch is also helpful for storing wet items that are unwanted in the tent. A highly durable tent is valuable against strong rain pours, winds, and other extreme conditions. With this in mind, it is ideal to pick one with strong tent poles, secured fastenings, and high-quality pegs that are very helpful throughout retaining the tent’s durability. For an overall strength, it is sensible to choose the best family tents with double-sewn seams. Family tent reviews and product descriptions will often say how easy a tent can be set-up and packed away. With this alone, you can narrow down the choices based on your requirements. As for the above mentioned tent models, they offer easy and quick setup in just several minutes, while other products will require a team work among camping associates. Similarly, the style of the tent is a significant factor to consider and again would entirely depend on your desire, and perhaps, your budget too. Cheap tents are sold on the market, and these varieties make use of certain materials and construction that are still durable and reliable, without compromising the quality, yet with reasonable price tags. Traditional A-Frame – The traditional A-frame tents create an ‘A’ shape when erected. This style of tent is made of lightweight materials, usually with an added tarp for extra protection. Most of these tents, however, are a bit heavy to carry around, although they are spacious inside because of the steep, sloping sides. Traditional A-frame tents do not normally surpass extreme weather conditions, especially during windy days because they are only composed of two poles at each end, forming an apex with a ridgepole running down the center. Modified A-Frame – The main difference between the traditional and the modified A-frame tent is the curved poles, rather than the straight poles. The modified version tends to offer more stability with an improved headroom and interior space. Modified A-frame tents also provide full coverage rain fly, allowing the campers to leave the tarp behind. Tunnel Tent – Tunnel tent is said to equate excellent stability when pitched end-on to incoming winds. But, when pitched the other way, it could be less stable. Tunnel tents are typically made of two poles or more for the width structure, giving more spaces for the headroom and interior. However, the durability still varies from brand to brand, poles used, materials, and size. Hoop Tent – This style of the tent has curved poles on either side, retaining the shape and stability. But, guy ropes should be tied with pegs and staked carefully for optimum pitching. This style offers a spacious interior and headroom because it is made up of three arched frames. With this style, rain water and snow can slide off easily. And, this type is the lightest and could be the most compact family tent on the market. Single Hoop – This tent style is made of a single curved pole, and usually designed to accommodate up to two people. A single hoop tent will not do very well in strong winds, although it could be quite sturdy if the wind runs against the tent’s spine. Hence, this type is perfect for backpacking and cycling for the weight and space factors. Dome Tent – This style is among the most popular and the best family tents for camping. A dome tent is made of two to three poles that pass each other across the center of the roof. Dome tents offer very spaciously living areas and headroom. Today, manufacturers have designed this tent style with the feature of having separate rooms as well as porches or areas for gear and equipment storage. Compared to other styles, dome tents can withstand extreme weather conditions like snow, and these are very easy to pitch. Other Types – There are other tent types such as the safari tents and the yurts, but these styles are usually more permanent and are used for different purposes other than for family camping tents. Tents also fall into five basic categories, ranging from the Summer/Screen, Convertible, Three-season, Tarp, and the Mountaineering/Winter. Summer/Screen Tent – This category of the tent has a maximum ventilation design and bug protection during the steamy summer months. The best family tents under the summer/screen category have strong skeletal systems with full coverage rain flies, surpassing weather such as moderate breezes and summer thunderstorms. These tents feature large swaths of mesh, allowing the air to flow freely throughout. Convertible – Tents under this category are perfect for campers who want to dip into all types of weather conditions. Convertible tents offer hybrid design, featuring vestibule, pole, and rain fly options, similar to most of the above-mentioned family tent reviews. The rain fly options allow the users to strip it down during summer trips or fortify it during stormy adventures. The walls of convertible tents also feature mesh windows with nylon panels that can be zipped close when necessary. However, keep in mind that tents under this category can be heavier than others. Three-Season – Three-season tents are geared towards keeping the campers dry and cozy, despite the wet conditions. Hence, these tents are perfect for spring to fall. These tents are also constructed to withstand strong winds, although not snow loads, while the walls are made of mesh combined with ventilation. Therefore, this design strikes a good balance between protection and ventilation. Tarp – Tents under this category are perfect for ultra-light campers who sacrifice everything just to save weight. Thus, a tarp is a solid sheet of polyester or nylon, which can be rigged with trees, boulders, trekking poles, or roots. But, very good knot-tying skills are necessary with these kinds of tents, getting the most of them as there are no floors or walls, including bug protection. Some manufacturers can produce weather-resistant tarps nowadays. Mountaineering/Winter – Mountaineering or winter tents are typically built for the most extreme weather conditions. These tents are made of sturdy pole structures, tough fabrics, and several external guy-out points. Typically, these tents have low, boulder-like shapes, helping shed winds, while the large vestibules are great for gear storage. The outdoors is an open-air dance floor that can be turned into something more than that, such as a shelter away from home. Thus, the best family camping tents can make this happen, allowing families and group of friends to spend quality time together, while camping, hiking, fishing, backpacking, and so on. Tents can certainly transform ordinary events into extraordinary memories, considering the different uses of various tents. 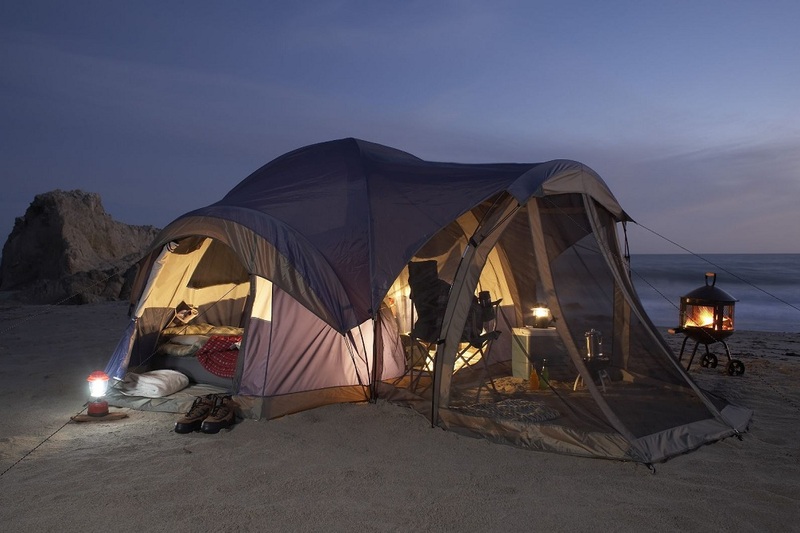 Decoration – Tents are not only geared towards camping needs. This kind of equipment can also serve as decoration and not just a guard against impending weather. While tents are available in plain colors, they, too, come in varied designs, such as majestic-hued tents splattered with gold stars, just perfect for a magical evening. The beam and pole can be concealed while adding embellishments like twinkle lights, flowers, chandeliers, and drapery. Waterfront Property – During camping, hiking, and fishing, a tent can be a very useful waterfront property, setting it up along the bay, river, or lake. Hence, the best camping tent brands can help in achieving this goal, blocking the unwanted outdoor elements such as bugs, too much sunlight, wind, rain, and most of all, snow. Ballroom – The best large tents can transform any ordinary walkway into an amazing scenery. Large, high-quality tents can turn a backyard, a walkway, parking lot, or field into a ballroom. Outdoor Patio – Tents are good options for last-minute get-togethers, creating an outdoor patio to accommodate friends and families for a great night of booze. Outdoor Kitchen – Today, many gatherings make use of the best large tent to serve as the outdoor kitchen, while hosting big events. The chefs and catered delicacies, preparation works and cooking, can be done under a tent without struggling with finding nearby venues. While tents vary based on the specific use, material, type, and size, tents today are becoming more and more popular among the modern backpackers and campers. Thus, cheap family tents are increasingly produced and offered by various manufacturers on the market. Family camping tents reviews also testify about the benefits and advantages of these camping tents that are perfect for every family, ranging from 4-member families to the best 8 person tent. Different brands, such as the above mentioned top rated family tents can also extend the camping experience, offering compatible and very useful accessories, gear, and add-ons for added protection, comfort and stability. All these details are essential, before buying the best camping tent on the market, considering both the negative and positive consumer reviews, the materials, type, purpose, size, and the brand of the tent. For added protection, considering the manufacturer’s warranty is equally important, while keeping in mind that the lifespan of every family tent varies largely on the frequency of its use and its overall construction. In this category, I love the Coleman Hooligan 2 Backpacking Tent. This super small tent is perfect for those that like to hike, and camp. It is very easy to carry and super lightweight. It measures 6 x 8 feet and can comfortably hold two people. It features a waterproof floor, protected seams, weather resistant fabric and a strong frame. It is quite easy to set up with just a one pole design in about 10 minutes. It features a mesh inner tent for ventilation and a rainfly to go over the top. There are pockets inside to hold your small necessary items. It weighs no more than 8 pounds to carry. Even though this is perfect for those that like to hike to their camping locations, it is not ideal for backpacking since it takes up a lot of room in a pack. Another great tent to consider in this affordable category is the Eureka! Solitaire Tent. As the name describes, this does only sleep one. It is a two hoop bivy style tent with a ventilated mesh roof and full fly for cover. The zippered roof is nice too for star gazing, and easy to get into and out of for that matter. The frame is shock corded for really fast setup. There are three storm guy outs on the fly, two storage pockets for essentials and one flashlight loop. Weighing only 2 pounds 9 ounce, this thing is super light. You should be aware that this tent is non-supporting so your soil must be good to plant the stakes. If you think you will be using this tent in rocky areas, it might not work so well. I used this in a horrible rainstorm that lasted 8 hours; the floor, sides, and top all stayed wonderfully dry. Check out the Coleman 8 Person Instant Tent. My biggest complaint about camping is the time it takes to setup and teardown. You can setup it with in one mint. The pole system comes pre-attached to the tent, requiring you only to extend the poles, click them together and lock them into place. Tents are the worst when it comes to eating into your day. I love how comfortable this instant tent is! It’s a 14 x 10-foot tent that easily sleeps, 8 people. With a center height of 6 feet 5 inches, nearly everyone can stand upright in this tent. It comes with a WeatherTec system that helps keep the tent, and its contents, dry. I love that we can opt to all sleep together in the same room, or use the divider to make a two room tent. This is a great option for families, so mom and dad can have some privacy, or older children don’t have to sleep next to the little ones. Overall, this has been a very durable tent for our family. Another highly rated tent is the Coleman Red Canyon 8 Person Modified Dome Tent. Measuring 17 by 10 feet, this can sleep 8 people. You have the option to remove the privacy walls or keep them up. If you keep them up, you can separate the tent into three rooms. It is made with weather resistant fabric and protected seems. Setup is quite easy with the shock-corded color code poles. 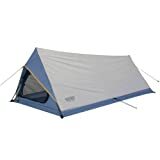 This one does take a few extra minutes compared to some of the others we’ve reviewed, but overall it’s pretty easy to put up versus tents made a couple of decades ago. It has a center height of 72 inches which is more than adequate. I love that it comes with a welcome mat and pockets, so your tent stays clean and clutter free. Going outdoors and camping in a American National park is the perfect vacation for the Family to enjoy. A modern family tent is a lot easier to raise than one might think and many of them are pop up tents. You can pitch these family camping tents by yourself, even though they are often pretty big. There are so many tent sizes and styles (such as bubble tents) that there is no shortage of selection and there should be a family tent with a price tag to fit every family. I am highlighting the best family tents that are suitable for easy outdoor activities and camping with the family where space and comfort is the main thing to look for. People have started swapping from expensive holiday trips to the low-cost adventures camping trips. But can the cut down on the money alone increase the fun? Camping couldn’t have caught one’s heart if the manufacturer’s had not taken efforts to build tents for all costs with all the possible comforts. Though a tent is designed to provide basic shelter, it is important to learn if its features meticulously fit for our requirement, for example: does our sleeping bag fit the tent size; is the tent big enough to accommodate the crowd, etc. every manufacturer designs a tent to serve every segment of the people but there have been cases when the tent does not fit in the buyers requirement. We understand your requirement and assist you in finding the best tent with a comprehensive research on every tent possible. This will influence your decision to pick the right one. You can find an independent research performed in every tent available in the market though we do not sell them personally. This is only to assist you to make the best buy with no intentions of benefiting a single tent entity other than the people in search of best tents. Following are the factors covered while choosing the best tents for camping. The tent needs on family, friends, couple. One can always buy a tent from any store close by to your place, but they cannot assure you satisfaction and comfort as their basic aim is to promote sales. Imagine, if your tent fails on the camping site? This happens to many people who blindly look out for products even without the basic knowledge. We will help you frame an unbiased decision on your choice of tents with our facts and figures. This will never lead you to an unwanted and a poor buy. And don’t forget this site also provides camping guide for one man trips or even a family trips. We cover all your camping needs from camping gear to camping games to play with your friends and family. The tent you carry for your outdoor recreational activity holds the highest importance. The poles, the covers, the fabric of the hiking tents, etc. can decide the life of your tent. Hence, it is essential to choose a tent which would prove long lasting. Let’s have a closer look at the features necessary to increase the lifeline of your tent. Poles form the framework of a tent, and thus it is essential to choose a strong, durable and a bendable pole material. The task is not to find a durable pole material but to reduce the extra load on a camper caused by the pole weights. Fiberglass: This was the traditional pole material used until being replaced with the much stronger Aluminum alloy tubing. Due to its less strength and heavy usage, it finds its place only in cheaper poles. Aluminum-alloy tubing: This comprises of the present day pole materials. Most poles are either pre-curved to avoid breaking while bending or it comes with multiple sections clubbed through elastic shock cords. Due to its corrosion property, most tents come in anodized form. Carbon Fiber: This fishing rod material forms the future of the tent poles. They are the strongest and most flexible, thus finding its place in the expensive technical tents. The framework of the tent is constructed with either a single layer or a double layer of fabric. Single Wall Construction: As the name speaks, there is only one layer of fabric covering the tent which takes the burden of fighting all the odds and as well as provides ventilation. 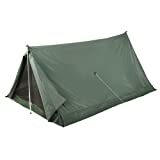 Double Wall Construction: This tent has an outer fly sheet along with an inner tent. This kind of construction gives the tent an added advantage as the fly sheet is waterproof and the inner tent does the work of transporting the moisture to the outer fly as it is made up of breathable fabric. The tent cloth does all the work of protection against wind and rain, acting breathable on the parallel lines, etc. Unlike the traditional tent clothes like leather and cotton, these days the tents are made up of much better and breathable fabrics like nylon and polyester taffeta. Water resistant: This determines the pressure of water on a square inch of fabric with zero leakage. A fly sheet with 80psi is idle to handle bad weather. Color: This shows the stand apart quality of your tent against the surroundings. Denier: Denier is the weighing mode of fabric in grams per 1000 meter length. A lightweight fabric should weigh around 50d. Double-needle stitching seam: To bear extra pressure and load, the fabric is given a double line of stitches. Single-needle stitching seam: Here, you will find only one line of stitches. Shed seam: This enables transporting the tent down the tent. Clear Film: Along with windows, the clear film finds its usage in skylights. Waterproof/breathable laminates: A waterproof but breathable at the same time, is a must for any tent material. This laminate is a layering system. Examples: Gore-Tex, Climate, ToddText, etc. Ripstop: Tents are prone to abrasion, and a small tiny rip can get worse. To avoid this, a polyester taffeta with thicker threads are weaved into the material at regular intervals. Polyurethane coating: This coating gives an extra protection against rain and wind as they are durable and waterproof. One can add any number of coatings at the cost of extra weight. Sleeves: This enables you to slide the poles in the sleeves respectively which can get tough during a rainy season. Clips: This gives you the liberty of clipping the tent to its pole with ease but at the cost of less strength. You can also enjoy an added advantage by looking out for a tent with the above combination. Grab your wallet and go shopping as you are now smart enough to choose the best tent for your intended purpose. You can also check out the accessories and gears if needed. You do not really need to spend that much for the best camping tents. Keep in mind that there are varieties of .options available that come in different features and price range. However, if you backpack a lot, it somehow makes sense to spend some more for bigger and quality camping tents. Few ounces might not really be a big deal however; backpacking is more convenient and fun if you cut weight down. Lightweight options for camping tents can make your camping fun and unforgettable. Your camping tent is always included in the list of things to be packed so it would be best to keep the weight of your tent at minimum. Note that the best camping tents should protect you against worst elements. An excellent tent can protect you from storm and keep you dry, safe and warm. These are just few of the critical considerations you need to keep in mind. Other considerations include capacity, interior space, and design elements, set up style, wall construction, durability, footprint and more.